Reminder to all the Friends that we will not be meeting in December. Our next monthly meeting will be next year in January. Enjoy the holidays and best wishes for a happy new year to all! Just a friendly reminder that our monthly meeting schedule does not include the month of August. Our next meeting will be held on Tuesday, September 8. This upcoming week is National Library Week, a time set aside to reflect on the importance of libraries in our communities and to show appreciation for the library staff. As we have been doing for the past few years, the Friends will be bringing in edible treats for the South River Public Library staff each day of this week. This year we are also asking patrons to help show their appreciation for the library staff by filling out a comment card and bringing it to the library. At the end of the week, the staff will read all the notes of appreciation. Thanks in advance for helping to make our library staff feel even more rewarded for being the best at their jobs. The next meeting of the Friends will be tomorrow March 10th at 7pm. However, due to a conflict created by the weather, we will be meeting in the downstairs meeting room (NOT the Sivess meeting room as previously stated). Everything else remains the same. 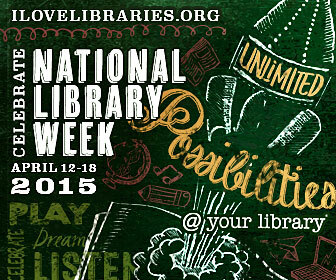 We will still be discussing National Library Week and a possible reception for the library’s new director. The meeting is open to the public and new members are welcome. The next Friends of the South River Library meeting will be held at the library in the Sivess meeting room promptly at 7pm on Tuesday, March 10. We will be discussing ideas for how to celebrate National Library Week as well as plans to welcome our new library director, Evalina Scheidegger. As always, meetings are open to the public and new members are welcome. There is no need to RSVP. We hope to see you there! Thank you to everyone who came out to our book sale this past weekend. Thanks to your generous support, the Friends raised $345 for future library programming and resources. We hope you all found some great reads in the process! 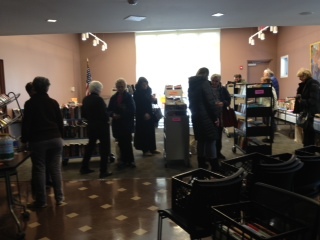 Library patrons browse the selection at the Friends book sale. Just a reminder that while it’s on a much smaller scale, you can always secure new reads for a low price at our ever-available used book sale. When you can come into the library, just head to your left past the DVD shelves to find our table and some great deals! 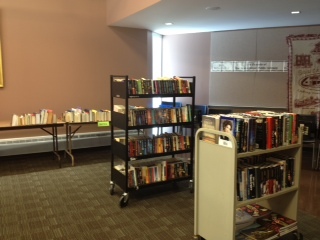 If you didn’t come out to the library yet for the Friends’ gently used book sale, you still have one more opportunity! The book sale continues tomorrow, open from 10am-2pm. You can find some great gems among our selection of teaching guides, cookbooks, picture books, mysteries, romances, biographies, and much more! Display of children’s books at the Friends’ sale. You can buy a reusable canvas Friends of the Library tote for $5 and fill it with as many items as you can for no additional cost. If you bought a Friends tote last time, you can bring it back and re-fill it for $5 again. 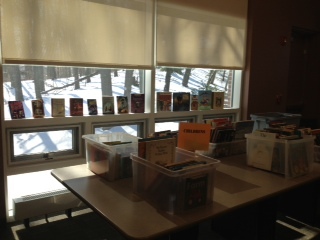 Carts of adults’ fiction greet patrons as they enter the Sivess room where the Friends’ book sale is being held. We will also be completing our membership raffle on Sunday. Anyone who joins as a Friend with at least a $10 donation is entered into the raffle to win a South River blanket. We hope to see you tomorrow!